We break down the Wagmer game - and we give our fearless prediction, below the flip. Like the Mountain Hawks, the Seahawks are aiming to reverse a multi-game losing streak, but Wagner's current problems are pretty much the opposite of Lehigh's. Since the season-ending shoulder injury to QB Alex Thomson, the Seahawks have had pretty good defensive play at times, but it's the offense that has let them down. Against Columbia, for example, the offense went 1 for 9 on 3rd down conversions and only was able to put up 14 points. Thanks to Wagner's game notes for this week's analysis. The Seahawks play a base 3 wideout, 1 tight end, 1 back set in a very physical offense that tries to out-muscle you on the line of scrimmage. Before Thomson's injury, head coach Jason Houghtailing ran an offense that balanced the run and pass fairly well, playing to the strength of their highly-touted signalcaller. But since the injury - at least against an FBS team like Central Michigan - Wagner became predominantly a running team, calling running plays about 2/3rds of the time. That has put a lot of pressure on the running tandem of junior RB Ryan Fulse and junior RB Denzel Knight to be a bigger part of the offense, combining for 416 net yards on the ground and 8 rushing touchdowns. Fulse is the big-play, quicker back - he had an 83 yard breakaway touchdown run against Columbia - and Knight is the bruiser, and Knight can catch the ball out of the backfield to some degree. If Wagner's offense is going well, it will be coming from the offensive line pounding Lehigh's defensive front, with Fulse and Knight getting big hunks of yards and big plays, while junior QB Luke Massei will be using play-action to keep the defense off balance, hitting the Seahawks' big receivers. What's been missing so far, mostly, from the Wagner offense is both of those things - big hunks of yards and big plays. Stuck in 3rd-and-long most of the game versus Western Michigan, the Seahawks were only 1 of 9 on 3rd down. In Massei's three starts he hasn't been asked to put the ball in the air much. His best day of the year was 13 of 19 passing against Columbia for 120 yards, and he hasn't had a touchdown pass yet this year. In his first start against St. Francis (PA) he threw 2 interceptions, but since then the pocket passer hasn't thrown a pick. Having said that, Massei does have three big targets to look at in the passing game in sophomore WR Adam Giordano (6'5, 215 lbs), senior WR John Williams (6'6, 210 lbs) and senior TE Caleb Scepaniak (6'6, 240 lbs). 6'2 sophomore WR Willie Dale has been the most productive of Massei's targets lately, with 11 catches for 125 yards. In the Western Michigan game, Scepainiak spent most of his time blocking with the tough, physical, huge offensive line of the Seahawks, featuring 6'6 295 lb senior OL Matt Diaz. Even against the aggressive, physical, big defensive front of the Broncos, Houghtailing surprisingly chose to do a lot of running off guard and off tackle. If they continue with that gameplan vs. Lehigh, hitting gaps is going to be absolutely vital for the Lehigh defense. Wagner's strength is their aggressive, physical, multiple 3-4 defense, who have already lodged an impressive 29 tackles for loss in 4 games, including 12 sacks. Their average of 3 sacks per game is tied for 17th in the nation in FCS. Seahawk sacks mostly are coming from the linebacking corps, where Wagner has an impressive set of interior linebackers. The first member of this interior linebacking combination is junior LB Santoni Graham, who leads the Seahawks in tackles (33) and has notched 3 sacks, including 2 versus Columbia. 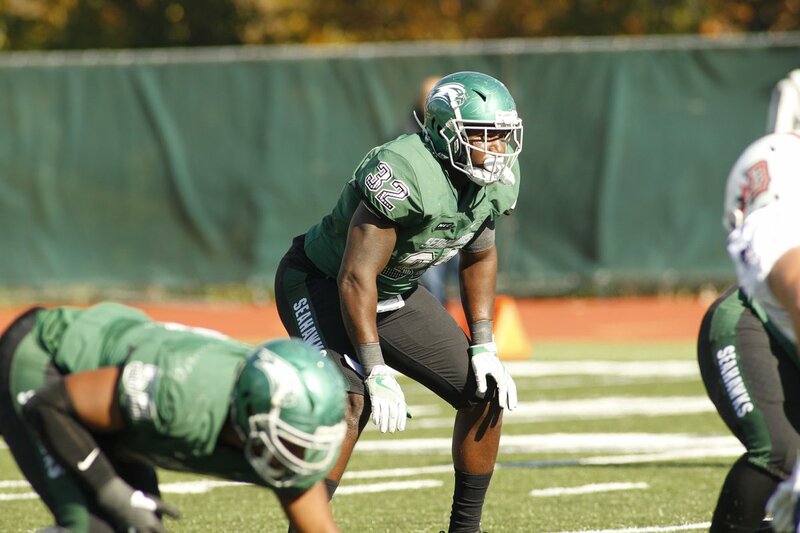 The other is the second-leading tackler on Wagner, junior LB Quintin Hampton with 31 tackles and 4 sacks, including at least one sack in every non-FBS game they've played this year. They're joined by sophomore LB Allaah Sessions, who has 2 QB hurries on his resume rushing the passer from the outside, and sophomore LB Cameron Gill, who notched a sack against Columbia. This young linebacking corps sets up shop behind an experienced front three in senior DT Kiser Terry, senior NG Christian Gore, and senior DE Jordan Baskerville. All three are the prototypical big, physical linemen needed to run an effective 4-3 and stop the run. Wagner's pass defense has been fairly effective as well, holding opponents to an average on 166 yards passing per game and only yielding seven passing touchdowns, three of them coming against Western Michigan. In addition, the Seahawks have four interceptions, one coming from senior DS Tyamonee Johnson and another coming from junior FS Sterling Lowry. Junior CB Malik Warner and sophomore CB Myron Morris round out the unit. Wagner's return game has been quite good this season, with senior PR Gerald Kahari with a 57 yard return to his credit and sophomore CB Myron Morris getting a 73 yard return on a kick this season. It definitely should be a point of emphasis this week by Lehigh. In contrast, the kicking game has struggled. Senior PK James Cooper has the leg - he's made kicks from 40 and 43 yards already this year - but has seen three kicks blocked already and has missed his last five field goal attempts. Freshman P Eric Silvester has averaged 37.2 yards per punt, though he has nailed a 64 yard punt in his young career. 1. Plugging Running Lanes. If this could be "Key to the Game" 1, 1a, 1b, 1c, and 1d, I'd make it so. With an offense that has been struggling, gap discipline is going to be hugely important in containing the Seahawk running game, and thus the Seahawk offense. It simply needs to happen this week - there is no more runway available. 2. Blitz Pickup. Wagner makes their living in the business of pass rushing and harassing the quarterback, so the Lehigh offensive line needs to be on top of the game of pass protection for junior QB Brad Mayes. Give Mayes time, and he'll pick any defense in the nation apart - just give him that opportunity. 3. Physical Play. Wagner tries to win by being more physical than the opposition in the trenches. If the O line and D line can win that battle on Saturday, I like the Mountain Hawks' chances. If you had asked Lehigh fans before the season if this game was going to be a win for the Mountain Hawks, they'd have been near-unanimous in picking Lehigh to win. But pretty much none of those fans would have expected this weekend's contest to be a battle of teams without a Division I win between them, both teams looking at the contest as an opportunity to get things on track before conference play. If a run through the rest of the season emerges, it will come from the blueprint of this game. It will come with meeting the challenge of Wagner's physicality, the challenge of building positive momentum and flow between offensive play and defensive play, and keeping mistakes at a minimum. This weekend needs to be a foundation on which to build.